Indoor Broadband Wireless WAN Extender with Sierra Wireless EM7305 Modem with dual SIM cards provides 3G/4G/LTE access for South America, Europe, and other International Carriers. DC and PoE Powered. A reliable WAN connection is essential for the modern enterprise. With businesses increasingly relying on cloud computing and remote applications, WAN connectivity must be always-on and downtime caused by an unreliable connection to the WAN is costly. 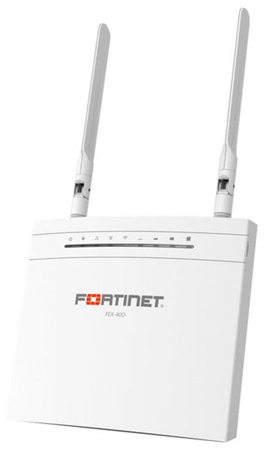 Ideal for the distributed enterprise, retail location and SMB, FortiExtender 3G/4G Wireless WAN Extenders work in conjunction with the FortiGate Network Security Platform to provide a 3G/4G WAN connection as a backup to the primary wired WAN link. The advanced FortiOS software on the FortiGate facilitates rapid failover from the wired connection to the FortiExtender 3G/4G Wireless WAN connection in the event of a wired failure, ensuring the enterprise location stays online and operational. 3G/4G are the latest high-speed wireless WAN technologies. Modern enterprises are ncreasingly taking advantage of these technologies not only as a backup for their wired WAN connections, but also as the primary WAN connection in locations such as; small branch offices, retail Point of Sale and kiosks. A FortiExtender 3G/4G Wireless WAN Extender enables a reliable and stable connection to support these applications. FortiExtenders are true plug-and-play devices. 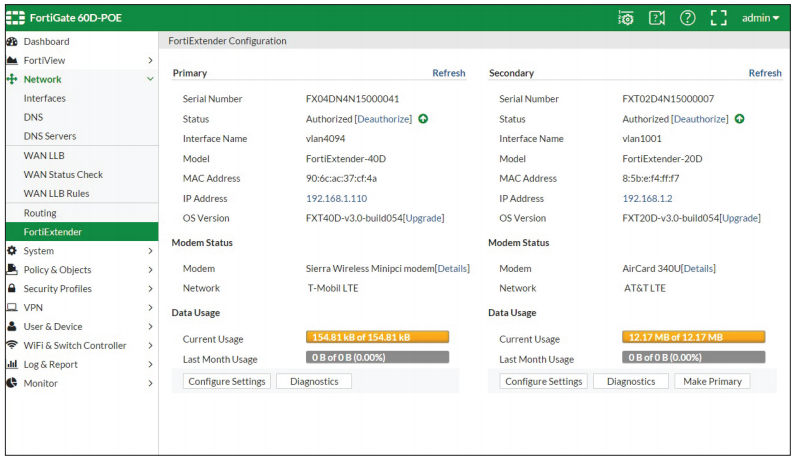 Once connected to the FortiGate, they appear as a regular network interface in FortiOS, providing single pane of glass management. This enables administrators to manage the connection as well as implement complete UTM security and control, just like any other FortiGate interface. In addition, FortiOS will display data quota usage on the Wireless WAN interface, providing complete visibility of the connection to ensure costly carrier data limits are not exceeded. The superior management, security and control of the FortiExtender ultimately reduces the Total Cost of Ownership for your WAN. FortiExtender devices have been engineered to be installed in the best possible location to achieve maximum 3G/4G wireless signal strength. The unit is powered using Power over Ethernet with both indoor and outdoor models available, enabling the device to be located for optimal signal strength, even up to 100m away from the FortiGate or Network Switch. The choice between indoor or outdoor models provides deployment flexibility based on the specific signal strength requirements for each location. 3G/4G Wireless WAN connection for Distributed Enterprise, Branch Office, Retail and SMB. Integrates into the FortiGate Network Security Platform Single pane of glass management of the wired and wireless WAN connections and security reduces Total Cost of Ownership for your WAN. Designed for Outdoor Use Can be located to maximize 3G/4G signal strength, without using lossy antenna cables or limited strength USB modem. Power over Ethernet Can be located up to 100m from the FortiGate appliance or network switch, to optimize wireless signal strength. Enterprise Performance Can be located up to 100m from the FortiGate appliance or network switch, to optimize wireless signal strength. FortiExtenders are a true plug-and-play device. Once connected to the FortiGate, they appear as a regular network interface in FortiOS, providing single pane of glass management. This enables administrators to manage the connection as well as implement complete UTM security and control, just like any other FortiGate interface. In addition, FortiOS will display data quota usage on the wireless WAN interface, providing complete visibility of the connection to ensure costly carrier data limits are not exceeded. The superior management, security and control of the FortiExtender ultimately reduces the Total Cost of Ownership for your WAN. FortiExtender devices have been engineered to be installed in the best possible location to achieve maximum 3G/4G LTE wireless signal strength. The unit is powered using Power over Ethernet with both indoor and outdoor models available, enabling the device to be located for optimal signal strength, even up to 100m away from the FortiGate or Network Switch. FortiOS Web-based GUI - complete FortiExtender visibility and control. FortiExtender can be placed near a window or outdoors for optimal signal strength. Certification notes: In general, you can activate the FEX-40D internal modem with most worldwide carriers, then simply install a SIM card and create a wireless WAN link. The built-in modem offers quad-band connectivity to HSPA+ networks worldwide and expected to work in 3G mode worldwide, subject to carrier support. There are exceptions however, as some carriers control the access to their network to specific carrier certified devices. These carriers allow only certified modem IMEI numbers on their network and have the ability to disable the LTE connection after a period of time. The following carriers are known to require additional testing to obtain certification. Please reach out to the Fortinet sales team and to evaluate your specific regional requirements: Brazil (VIVO), USA (Sprint), New Zealand, Arabian Peninsula (all carriers), UK (All carriers). Download the Fortinet FortiExtender Series Data Sheet (PDF).